You Are Here: CushTravel > Asia > South Asia > India > Bangalore > Neeladri Amusement Park: Water, Waves, and a lot of Fun! Bangalore is the capital city of Karnataka State in South India. It is one of the top cities in the country, most notably for its world-renowned IT industry and software companies. Clearly the technological hub of the country, Bangalore attracts thousands of visitors and vacationers every month not only for its modern facilities but also its several historical sites and natural resources. There are hundreds of temples, colonial structures, historical sites, palaces, natural reserves, parks, waterfalls, art galleries, museums, public markets and modern shopping centers. Although Bangalore is relatively cooler than most leading Asian tourist destinations, the scorching Asian heat is still a challenge for most Western tourists, especially in summer. 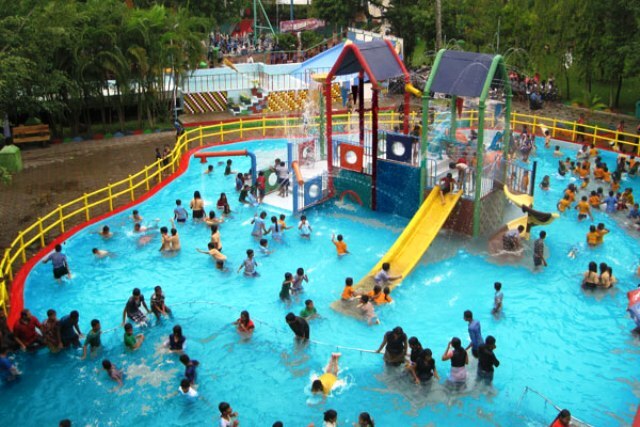 This little inconvenience, however, does not seem to bother the many vacationers to Bangalore, but to help them beat the heat, Neeladri Amusement Park is the place to go. The city has a number of amusement parks and the very first theme park that was ever built was Neeladri. It is complete with all the facilities and rides that one can hope for in a theme park. Even the food stalls are designed to be very colorful and attractive to children. Clearly, it is the water park and water rides that set this theme park apart from the other parks in the city. Visitors love jumping into the cool and refreshing water. Water slides and boat rides are very popular and often jam-packed. The most popular rides are Family Slide, Formula 2, Zyclone, Bouncing Castles, Guided Cars, Bumping Cars, and Water Chute. And to make sure guests enjoy as much as they can without worrying about their personal stuff, locker facilities are available. Other fun rides include a roller coaster, mono-rail ride, caterpillar ride, pedal boats, swings, bump cars, fountains, a wave pool, the Wonder Wheel, Family Train, Parachute Tower, Columbus, Break Dance, Slam Bob, Flume Ride, Zoom Zoom, Lazy River, and Tele-Combat, just to name a few. There are more rides that are sure to keep visitors busy, engaged and happy for an entire day or two. Meanwhile, Bangalore offers other parks and amusement centers for everyone. There are many avenues for leisure and entertainment since the city is a leading destination for working people and pensioners from all over India and the world. Much newer than Neeladri is the huge Wonder La theme park. It also offers amazing water rides such as the Lazy River and Wave Pool. It has a musical fountain and laser show, but what’s really notable about Water La is that it keeps its premises and facilities always clean, hygienic and safe. Other recreation destinations are Fun World, Crazy Waters and Bal Bhavan, which is found inside Cubbon Park. Together with Neeladri Amusement Park, these fun facilities prove that Bangalore is a city for everyone, including kids and entire families.